<br />Note: You can also include SoundCloud links on your mod pages and the forum. <br /><br />BigBizkit: Most people probably know your name from your massively popular Sim Settlements mods for Fallout 4. However, to start this off, could you tell us a bit about yourself? <br /><br />kinggath: Sure, I am a freelance web designer/programmer, I do a little bit of everything in IT and I’ve been modding since I was about 15. I started out modding Quake 3 and I used a different name that I refuse to reveal because I released a lot of teenage angst-y garbage mods that no-one needs to find out about. Then I moved on to Half Life, I modded Starcraft, Warcraft 3 - just every game I get way into I end up finding myself modding, but Fallout 4 is the first one I took it seriously with. Where I was just like “I love this franchise and I want to make this game way better.”. <br /><br /><br />Pickysaurus: So for someone who’s never heard of you or your work before could you describe what your mods are and what they do, in your own words? <br />I’m best known for Sim Settlements and all of the expansions that go with that, but before that the first mod I released for Fallout 4 was Salvage Beacons which was my immersive solution to pack-ratting. I think most Bethesda players just get obsessed with picking up everything in the world and I found myself kind of cheating by using backpack mods that would let my character carry 1,000 pounds or whatever and I wanted a more immersive experience. I saw we had these settlements, that were pretty much useless, so I came up with a way to set up a settler job where they would come and pick up stuff in places you left [a beacon]. So that was the first mod, that got fairly popular and then I was playing Survival Mode and I got sick of building all the details necessary to make a cool looking settlement so I logged out and started working on what has become Sim Settlements. 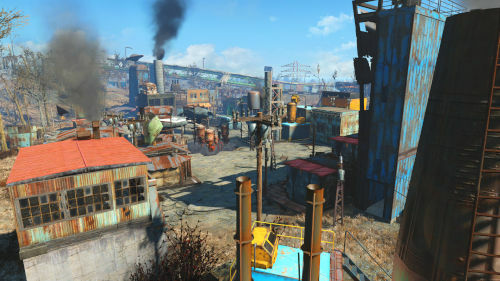 <br /><br />Sim Settlements is basically a way to quick get a good looking settlement and have a reason to come back to your settlements, because one of the things I thought was kind of wasteful in the [vanilla] settlements is that you put all this effort into build them and you know exactly what it looks like so there’s no reason to come explore it. The whole thing that draws us into the Bethesda games is exploring, so I took kind of the SimCity model to start - it’s definitely gone way beyond that now. That was my inspiration to start because it kind of gives you a ‘SimCity’ way to play with settlements. So instead of you building individual beds and crops and laying down structures, you just put out these zones that we call ‘Plots’ and the settlers that move in will automatically build something at random in that kind of field. So residential they’ll build a home, commercial they’ll build a shop, etc. <br /><br />So that’s the quick synopsis, it’s grown a whole lot more and you can actually have the entire settlement build itself. So there’s a lot of depth now to Sim Settlements after it’s been in development for about two solid years. <br /><br /><br />BigBizkit: On to a completely different question. When you are not busy with modding, what other hobbies do you like to pursue? <br /><br /><br />Pickysaurus: So outside of Fallout 4 do you play any other games? <br /><br />Not currently. Generally - so I find I will get obsessed with a game and then I’ll mod it for a while and then when I’m done with the game, I’ll move on and quit modding it. The was my pattern before, now with Fallout 4, I’ve decided instead I’ll set myself out a goal of what I am trying to accomplish. Basically, I am trying to build the experience I want to see and once I get to that point and I feel that it’s complete then maybe I’ll move onto another game,* I put myself so hard into my projects that it’s hard for me to have too many going on at once. I focus better if I only work on one thing. <br /><br />I’ve been asked by people if I’m going to make any other mods for Fallout 4 and I have a few others in mind but most likely my big and only contribution to Fallout 4 is probably going to be Sim Settlements or other things in the settlements category. That's just kind of what I got hooked on. *I really think there’s a lot to be done with the settlement game-play in Fallout 4 to make it more of a cohesive experience. <br /><br />So there’s still a lot more for me to do, but I haven’t really looked at any other games to mod in a while. I don’t know which ones I would want to, maybe Witcher 3 but I think by the time I get around to that maybe Cyberpunk will be a real thing and I’ll want to mod that. I think any games I’m modding would be RPGs of sorts and Bethesda's [titles] are nice just because they give you the tools and they encourage the modding, especially now with the built in mod manager right in the game which I would hope to see in more games in the future. Until more of them start offering that I think I’m sticking with Bethesda. <br /><br /><br />BigBizkit: Speaking of future games to mod and Bethesda games, with you being a prolific Fallout 4 modder: What are your thoughts on Fallout 76 so far? We reckon it will eventually allow mods in one form or another, so do you have any plans for that? <br /><br />It depends. So the gameplay loop right now looks too much like MMOs - like they’ve talked about how there’s going to be rare materials you’ve got to farm. Endgame loops like that tend to bore me. I prefer the single-player experience. <br /><br />There’s a couple of things I love about it. One is you feel like you’re the god of that world eventually because you get to be so overpowered and there’s nobody else that can interfere with your experience. You get to decide how it’s going to play out - aside from the exploration in the first time you go through where you’re learning about all the new things in the game world. So the multiplayer side of Fallout 76 kinda irks me - I think a lot of people who are big Bethesda fans feel the same way. It's jarring. It’s a little hard to wrap your head around how you’re going to have the same experience in there, but at the same time, I used to mod multiplayer games exclusively so I am intrigued about the idea of doing some multiplayer modding again but it’s going to depend on how they do it. <br /><br />They have been very vague about how that is going to work, there’s also the timing issue. We have no idea how long it is going to take to get the modding tools. For Fallout 4 it took about 6 months before they got us modding tools. I can see it taking a lot longer for 76 given how long it usually takes MMOs to get their ducks in a row and their servers stable. So I imagine they’re going to wait until after that to give us those tools. <br /><br />If I find the game enjoyable. Because it looks beautiful, I’ll give it that. It looks incredible and I really hoped it was going to be single-player when they first dropped the trailer just because if we get that kind of engine improvement there’s so much that can be done. So depending on how they do it, I might move over to it but if everything I know right now holds true - which is the way multiplayer games tend to play out - they're just not in my favourite game styles right now. I generally get bored of those game-play loops and I don’t know that I want to participate in that. <br /><br /><br />Pickysaurus: So some of the authors we’ve spoken to previously, such as TheModernStoryTeller and Enai Siaion, have been looking at transitioning from modding into game development. Is that something you have interest in or could see yourself branching out into? <br /><br />I’m not sure. So there’s a couple of problems with going into game development; one is the requirements to do so grow exponentially because you suddenly lose access to all of these assets you have, you lose the core gameplay loop that’s already done for you so the workload goes up dramatically. I’ve got about 2 years of development time into Sim Settlements - and that’s using pretty much every moment of free time I have and then some moments that shouldn’t have been free time that I used anyway - so I’m already pushing the limits about the amount of time I can put in and even now this is with a big team. We’re still not creating even close to the content that would be required for a game. If I extrapolate out the amount of time we’ve been working together as a team and the content we’ve created, I think we have maybe one one-hundredth of the content that would be required for a full game, especially if I wanted to continue to do games to the size and scope of games like Bethesda’s games. So, yes I would love to get into full game development but I don’t know [chuckles] - I don't know if I can handle going through the “food chain” of game development - like working from the bottom up through a company, which is pretty much the only way I could see getting a chance to work on the big games I like. Then, the other option would be going indie dev which has its own set of problems: the financial strain, the stress and the project would have to be substantially smaller in scope. I’m interested in it, but I’m not sure I see a realistic path to get there. <br /><br /><br />BigBizkit: Alright, going back to your Sim Settlements mod. Is there any creations from other users based on Sim Settlements that you were particularly impressed by? <br /><br />Yeah, there’s a few of them. In fact, that was one of the things I was so fortunate with Sim Settlements and so happy that it took off. When I was developing it, I had this big master plan for it - like it’s going to have hundreds of buildings, etc. So as I started designing the buildings I’m like “Oh, this takes a while, this is not something I can do myself”. There was a point early on in development where I reset and rebuilt it from the ground up so that it could be expandable and then I wrote a simple tutorial kit. Now that’s taken off, there’s a tonne of content created for Sim Settlements by the users. Ruinedworld's mods - I think his design style is incredible because it really matches the Fallout 4 aesthetic and his plots usually put mine to shame. He’s actually now on the Sim Settlements team and not only works on his add-on but on the main mod as well. Tinuvia and Myrmarachne - their stuff is incredible, it’s very creative and artistic looking. It’s a little bit outside the Fallout aesthetic, so I don’t use it personally in my game, but their stuff is really detailed and really well done. Samutz - they put out a vault pack recently, it’s super interactive and all the things are animated. That one's really, really cool. <br />There’s so many to talk about, I’m sure I’m going to leave out somebody and they’re going to feel bad that I didn’t mention them but all of the add-on packs have great things about them. These guys have been experimenting to push the limits and some of them have inspired me to add new features to give them more power. Sim Settlements really wouldn’t exist as it does today without the add-on pack developers - They are awesome people and they’ve really really made the mod what it is today. 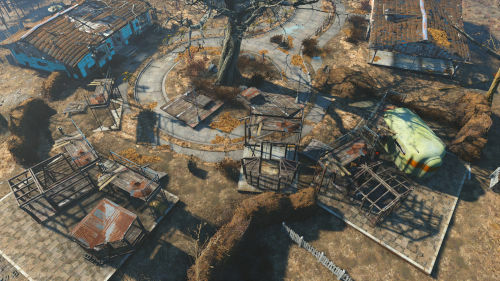 <br /><br /><br />Pickysaurus: Ok, so a slightly odd question for you now: Has there ever been a feature for Sim Settlements that you weren’t able to get working and really wish was possible? <br /><br />I’ve got a couple actually. One is kind of sitting there waiting, one of the things I’ve been hoping is that, with Creation Club forcing updates, I was really hoped we’d start seeing more functions pop up. That hasn’t really happened so I’m holding out that it will but otherwise I might add some F4SE support in future for PC players. Although as I’ve described to a lot of players who ask that is not a key priority because the number of people using F4SE is actually really small relative to the number of people who play Fallout 4 and mod it. Not only can Xbox players not use it, but the number of PC players who use it is shockingly small out of the total because so many people get annoyed with the fact that their games break so they just don’t bother. Anyway, one of the features, in particular, is a “Power Armor Store” I have added to Sim Settlements with the last expansion and one of the options you’ll see in there will say “No Repair Needed” but that was actually supposed to be dynamic and allow you to pay to have your power armour repaired as a quick repair option. Instead of having to go into the workbench and having to individually repair each piece, I thought it would be fun to repair with caps really quickly and that’s just not possible in the base game. <br /><br />Another one I have that’s half developed that again isn’t possible without F4SE is an armoury. Like a proper ‘equip all your settlers automatically’ armoury. There’s just no great way to do that with Papyrus by default. <br /><br /><br />BigBizkit: You provide substantial support for your mods and you keep developing them even further. Can you tell us, for those who don’t know, what is new in the most recent update for Sim Settlements? And do you have any plans for the future - if so can you give us a little bit of an insight into those plans? <br /><br />In the latest big update, which is still kind of on-going - we still have a few snippets of content coming out. * All of July we’ve been celebrating the 1 year anniversary of Industrial Revolution - my personal favourite thing to work on so far with Sim Settlements. In the latest update, we added a new tech tree, which if you’re not familiar with that part of Sim Settlements, essentially there are these buildings that as they upgrade they unlock new technologies which allow you to build other buildings. It’s all interconnected, there’s things to find in there and secrets to unlock. At the top of this tech tree - to my knowledge no one has figured out how to unlock it yet - we added the Euclid's C-Finder from New Vegas which lets you control a satellite from space and use it as a weapon. It’s really amazing! Shoeburglar did this really sweet weapon for us. <br /><br />So I’m really excited to see the first person who figured out how to unlock that without cheating. I assume there’s already somebody out there who just dug into the Creation Kit, decompiled my scripts and figured it out, but I don’t think anyone has figured out how to naturally unlock it yet and I’m really excited to see if somebody can figure it out. <br /><br />As far as stuff coming up, we have been working on a massive, massive expansion for Sim Settlements. We’ve been working on it since September of last year (2017). I tend to keep about 3 or 4 projects going at all times. We kind of broke up the team into groups and I try and manage all of them. I focus on the live content, which is how we keep up with weekly or bi-weekly updates. There are always teams working on bigger chunks of content which is how the expansions come to be. We’ve got a really big one which I think is going to finally accomplish the goal I set out to originally and anybody who watched my in-depth series of YouTube videos on Sim Settlements will know, I described my vision for Sim Settlements. Our goal with this next one is to finally hit that, which is fully integrating settlement gameplay into the rest of the game so it feels like it belongs there and doesn’t feel like a separate game. Because, right now, even with Sim Settlements, playing around with settlements feels either meaningless or it feels like you’re playing a different game. It’s like I’m playing the settlement game or Fallout 4. I’ve always envisioned that the two could be interwoven so that they feel like one thing, where one drives the other and it has a cyclical gameplay loop where you want to do both and not just focus on one or the other. <br /><br />Pickysaurus: Finally, is there anything else you would like to say to the Nexus Mods community about yourself, your mods, or in general? <br /><br />Just, thank you. The amount of support I’ve got from everybody, from the staff at Nexus - you’ve been awesome about helping with issues and setting us up some sub-categories and not complaining about serving probably terabytes of patches I’ve put out - and then everybody for giving all these awesome comments and being patient with me when I have bugs to fix. The community has just been amazing and I just have to say thank you because it’s really pushed my abilities as a modder and a developer to the next level. The amount of people who have got on board with this and encouraged me, it kind of forced me to step up and take it seriously and I’m learning all sorts of stuff that’s going to help me in life in general. As you said, I offer a lot of support and it’s kind of turned this into a little organisation. I’ve had to learn a lot of new skills and I operate out of a calendar now, broken down by hour and I feel like a miniature Elon Musk* here with how streamlined my life has become in order to facilitate all this. When I first started doing that, it was scary - I’m actually used to having a little more loose lifestyle - but it’s [changing to a strict schedule] actually allowed me to be a lot more effective across the board in my life and I’m very thankful for the opportunity to give everybody this big gameplay experience. There are a lot of players who play Sim Settlements almost exclusively, that’s what they do with their free time, and it’s fun to be a part of that. I’m now in charge of their core gaming experience. It’s been a lot of fun and I just have to keep saying “thank you, thank you, thank you” to everybody in the Nexus community. <br /><br />BigBizkit: Thank you very much, Kinggath for taking the time out of your day to talk to us. <br /><br />No problem, thanks for having me.